Let’s be honest with each other: Spring Break generally consists of doing two main things: hitting the beach during the day, and clubbing at night. It’s a formulaic schedule that works, no matter what day of the week. So, we’re not here to tell you that you need to stop doing what has defined the essence of Spring Break for the past half century. We just feel the need to shed some light on some of the “other stuff” you can do during your Spring Break 2014 vacation – to mix it up a bit (?). After all, you’re going to be at the ‘World’s Most Beautiful Beaches’ for a full week! You should be experiencing some of the things that make Panama City Beach a unique place. Known to have some of the highest concentrations of bottle-nosed dolphins in the world, taking a famous Panama City Beach Dolphin Tour (and dolphin swim!) is a very popular thing to do. And did you know that Panama City Beach is also regarded as the Shipwreck Capital of the South for its many underwater shipwreck discoveries? If you’re into diving, this may be a great way to explore a whole new world. If under-water exploration isn’t your thing, there’s always above water – as in high above water in a helicopter. PCB private helicopter tours allow you to view the coast from a bird’s eye view. It’s a real thrill (and will give you some pretty amazing stomach butterflies), and best of all, it’s not very expensive, especially if you’re sharing the cost between two or three of your friends. If heights aren’t your thing either, perhaps renting a Pontoon boat and cruising to ShellIsland for an entire afternoon might be just the thing you’re into. You and your friends can coast through the emerald waters to find the perfect spot to anchor and just chill. Then there are the things that aren’t so unique, but are nonetheless fun and memorable to experience. Parasailing over the open water is a definite rush. Zip-lining across the sandy beach from several stories high is a kick. And, yes, what would a vacation be without a little shopping at the local outlet mall. Touring from store to store can be quite fun when you’re visiting a mall you’ve never been to, even for those not-so-avid shop-til-you-droppers. So, as you can see, there’s a lot of things one can do aside from beach bashing and club hopping. 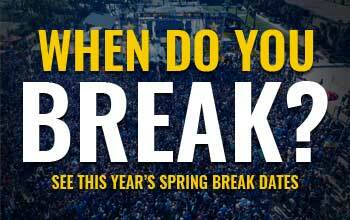 Obviously, the choice is yours on what to do, but some times it’s the “other” stuff we do that can make our Spring Break experience more memorable.